There is no doubt that Vladimir Putin is the world’s most powerful President. By comparison, while China’s Xi Jinping is highly powerful and intelligent, China’s leadership retains a collective element while in Russia, Vladimir Putin maintains an unwritten but obvious veto power over all major decisions. In the United States, the very idea that Donald Trump is an all-powerful President is now laughable even to most Americans, including those who support Donald Trump. By the same extrapolation it is abundantly clear that Benjamin Netanyahu, the Israeli leader is the world’s most powerful liar. His power comes from the fact that he is in charge of the highest portion of weapons of mass destruction in the Middle East, including nuclear weapons. “…where the defeated Islamic State (Daesh) group vanishes, Iran is stepping in”. This statement is disingenuous on many levels. First of all, Netanyahu stated to Putin that he felt that Iran is a danger and secondly, that this danger is tantamount to that of Daesh. Iran has not invaded a country in its modern history and there is no evidence to indicate that this will change. By contrast, Israel occupies Syria and Palestine and formerly occupied Lebanon and Egypt. During the course of Syria’s struggle against Takfiri terrorism, Israel repeatedly bombed Syria illegally. Inversely, Iran’s presence in Syria, like that of Russia, is legal according to international law as it is at the behest of the Syrian government. Secondly, to equate a state like Iran with Daesh is preposterous. Iran is first of all far more powerful than Daesh has ever been. Daesh is a terrorist group which is quickly crumbling in both Syria and Iraq. Iran is a large state with a professional and highly trained armed forces. Iran however, uses its military and political influence to fight Takfiri terrorism whose methods, and sinister ideology is anathema to the Iranian Constitution and to the values of the Islamic Revolution. If one is even slightly interested in fighting Daesh, it logical to thank Iran for its valiant efforts against the wicked group which along with Russia are the only two major non-Arab countries which are combatting a group which has set up base across the Arab world. “Iran is already well on its way to controlling Iraq, Yemen and to a large extent is already in practice in control of Lebanon”. This again is a lie. Iran controls Iran and no one else. Iran does not have puppet states in the region in the way that America has had and continues to have puppet states and client states throughout the world. What Iran does have and what it has increasingly, is respect in the Arab world. Iranian forces are in Syria because the Syrian government asked for their assistance in fighting Takfiri terrorism and Iran agreed. Russia finds itself in the same position. Iran has many supporters and admirers in Baghdad and Iran has helped train Iraqi volunteer units which are fighting and winning the battle against Daesh in Iraq. In Lebanon, Hezbollah is of course a pro-Iranian political party, one which holds two Cabinet level ministers in the Lebanese government. Hezbollah’s military aims are defensive. Their primary goal is to prevent further occupations of Lebanon by Israel. Hezbollah also has worked with the Syrian government to fight Daesh and al-Qaeda. Israel is a country that has fought wars with all of its neighbours and has occupied most of them. Iran by contrast has occupied none of its neighbours but in the 1980s was the victim of a war that Iraq started with western support. The two situations are objectively incomparable. One does not have to be ‘pro-Iranian’ to realise this fact. It is a fact that the world acknowledges, including elements of the Arab world which are hostile to Iran. 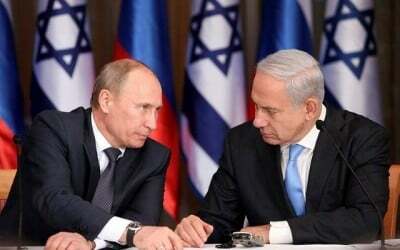 Vladimir Putin wisely refrained from responding to Netanyahu’s anti-Iranian tirade. The nature of modern Russian diplomacy is to quietly execute its objectives without needlessly entering into arguments with extremists. Previously, when Netanyahu told historical untruths about Iran, Vladimir Putin did intervene, telling Netanyahu that it is best to focus on modern events rather than ancient history. Israel’s anti-Iranian rhetoric is increasingly unpopular in the wider world. Even in Europe, most companies and many countries would rather do business with Iran rather than enter into an ideological struggle on Israel’s terms. Only the United States, Saudi Arabia and Saudi’s client states share Israel’s stance about Iran and none of the Arab countries have the ability or in reality the nerve to start a way with Iran that they would clearly not win. The great pity is not that Netanyahu continues to tell provocative lies about Iran and the wider region, the pity and the danger is that anyone could still believe him. Iran does not threaten any nation with aggressive war, but if Netanyahu’s impassioned rhetoric foments a war, Iran will defend itself. Those interested in peace ought to ignore Netanyahu and work instead for the important cause of greater peace, cooperation and dialogue, not just in the Middle East but in the wider world.